On February 15, 2005 we received a call from HCW Development Company, the developer of the Branson Landing, indicating that "The Liberty Tree" had been taken down. This came as a complete surprise to us as we had expected the tree to remain a part of the development. We had earlier indicated our interest in the tree, if it ever had to be removed. City of Branson officials were advised by their attorney and insurance carrier to have the tree removed due to liability reasons. The tree had been in a steady state of decline since being struck by lightening in 1996. Decay and hardwood borers had infested the tree. 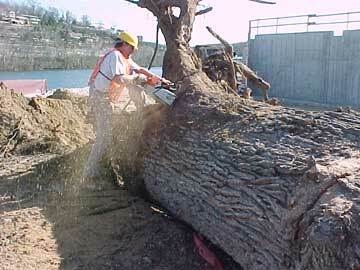 The tree was removed as directed by City of Branson officials. Upon receiving the news that the tree had been felled, we loaded up our chain saws and headed down to the Branson Landing site. 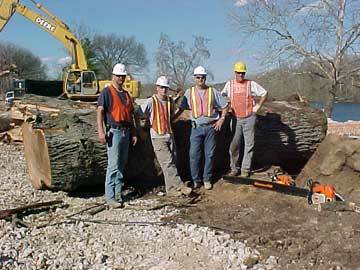 Once at the site we inspected the tree and noticed that a large portion of the top limbs had disintegrated upon impact during the felling process. Many of these limbs were hollow and rotten. The trunk and one of the larger limbs appeared to be in decent shape with some rot and decay on the outer edges of where the tree had been struck by lightening. We began laying out our cuts. The main trunk section was to be cut into three sections; one 8, one 9 and one 10 foot long section, starting at the main triple crotch of the tree. Usable sections that could be milled into slabs would include on 14 foot section of a main limb and an 8 foot section of a secondary limb. 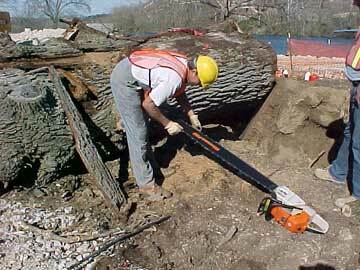 When the layout was complete Rick began bucking the trunk into sections using an 084 Stihl chain saw with a 60" guide bar. Within an hour the tree had been bucked into lengths and was being loaded with a huge track-hoe onto a long lowboy semi trailer to be transported to our Design Studio. 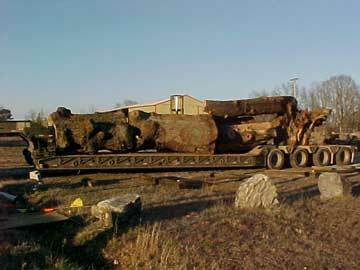 In all, three main sections of the trunk, the root ball and one main limb were hauled on the trailer to our Design Studio. In addition, two dump trucks were loaded with any limb sections that were not broken into splinters during the felling of the tree and hauled to our storage yard. Due to the size and weight of the main trunk log sections we had to roll them off of the trailer with our rough terrain fork lift. Once on the ground the sections were pulled into position using chains because our fork lift could not lift the log sections in their entirety. Approximately two hours after the truck arrived all of the main trunk sections and the root ball had been unloaded and staged along the Hwy 86 frontage in our storage yard. This is where it will lay until a decision by the City of Branson and HCW Development Company determines how the tree is to be used. 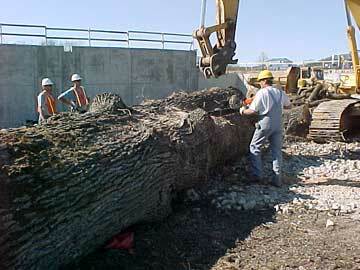 Planning is currently underway to integrate a portion of this historic tree back into the Branson Landing Project. 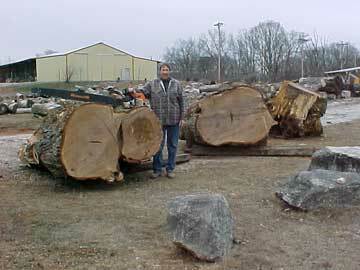 More can be read about the felling of "The Liberty Tree" by visiting the Liberty Tree News link. Below are select photos and descriptions of "The Liberty Tree" from the time it was felled until it was staged in our front storage yard. Rick beginning his first cut on the upper section of the main trunk. 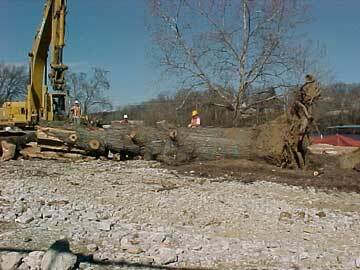 The arm of the track-hoe that felled and loaded "The Liberty Tree" can be seen above Rick. A different view of the first cut showing the scale of the tree with the bull dozer in the background. Rick beginning his second cut on the main trunk section. The first cut can be seen on the right. We decided it would be best to cut the root ball free before completing the second cut so that the weight of the root ball would not lever the remaining 10 foot section of the trunk in the air once the second cut was completed. Rick is starting to cut the root ball free in this photo. Rick inspects and clears saw dust from the chain on the 084 Stihl chain saw with 60" guide bar before completing his final cut. The first and second sections of the main trunk of "The Liberty Tree". 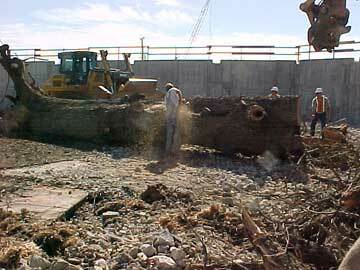 Members of the excavating team and Rick give scale to the tree. The Stihl chain saw used to buck the tree into sections is in the foreground. "The Liberty Tree" ready to be unloaded from the lowboy trailer at our Design Studio. All three main trunk sections, the root ball and one of the main branches is on the trailer. 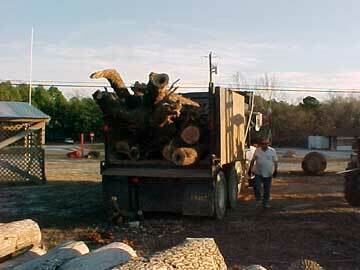 One of the dump truck loads of branches from "The Liberty Tree" ready to be unloaded in our front storage yard. 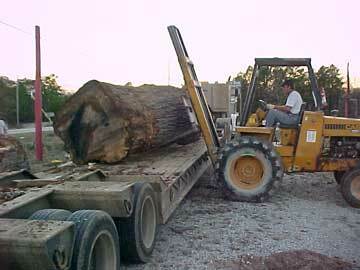 Rolling one of the main trunk sections off of the lowboy trailer using our fork lift. 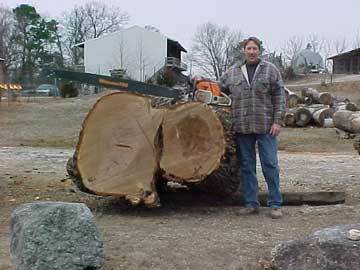 Rick standing next to the upper section of the main trunk holding the saw used to buck the trunk into sections. The second trunk section and root ball are in the background. A closer view of Rick with the third section of trunk. The saw used to cut the trunk sections is a Stihl 084 with a 60" long guide bar and chain. 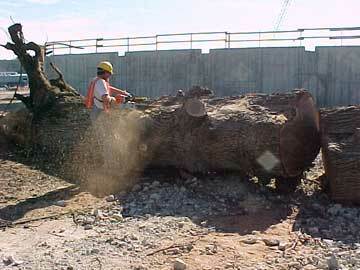 One of the main limbs with a few of the secondary limbs that survived the felling process. 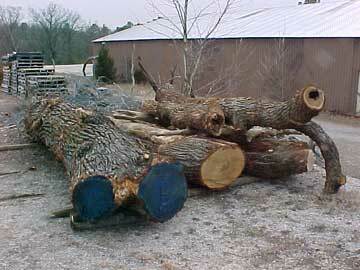 The limbs were trimmed and moved to our inside storage yard.